Makkah - a sign of Judgement Day!! 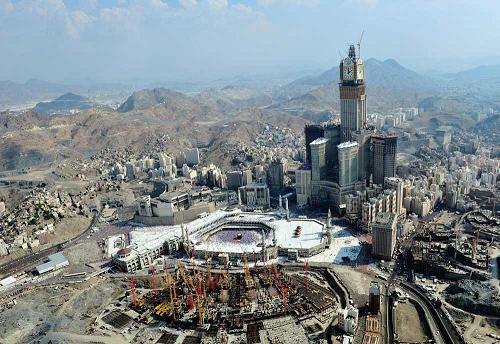 You are here: Forum Index » Sharing & Voicing » People's SayMakkah - a sign of Judgement Day!! Nearly 250 workers are working to finish the construction of what will soon be the tallest golden minaret in the world which is targeted for completion within three weeks before Ramadan. Work on the minaret, which will be topped by what will also be touted to become the world's largest crescent, is progressing well, sources said. This is just the start. Wait for the Hadtih to follow. Wait for the pictures to follow. With thanks to sister Roukaya. Imaam Bukhari (rahmatullaahi alaih) has reported in his Saheeh, on the Authority of Hadhrat Abu Hurayrah (radiallaahu 'anh), that the Prophet (sallallaahu 'alaihi wa sallam) said, 'The Hour will not come to pass untill...' (the Prophet sallallaahu 'alaihi then mentioned various signs). Amongst them it was mentioned, "People will vie with one another in constructing tall buildings." 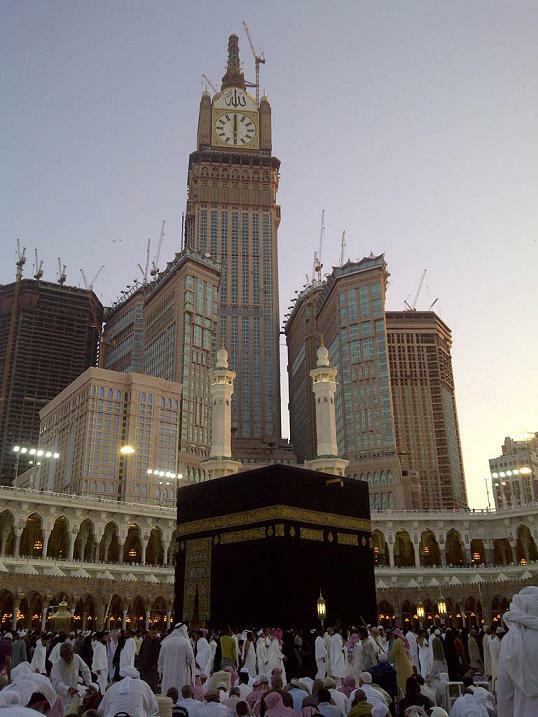 The Spire and Crescent of Makkah Clock Tower. 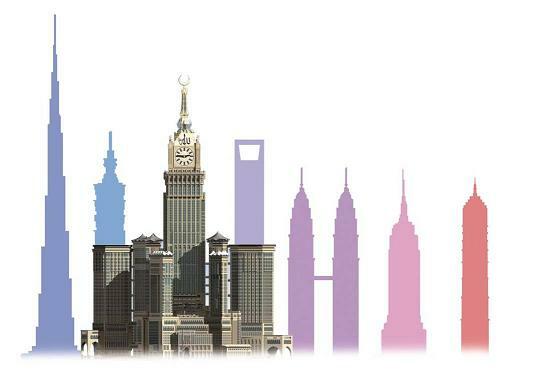 The Makkah Clock Tower is topped by a 93 m tall spire and a crescent. The spire will contain a lunar galley, a control tower and an observation pod. Over the spire is the world's largest golden minaret including the 23 m tall golden crescent. The crescent was constructed in Dubai by Premier Composite Technology in April 2011. 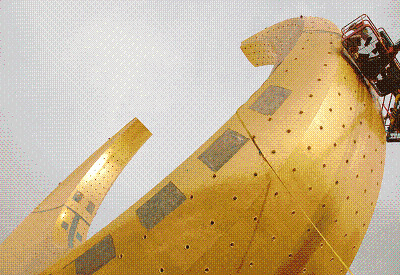 The crescent is made of fiberglass-backed mosaic gold, and it weighs up to 35 tons. Peugeot Joseph, the company official, said a team of five engineers and a hundred workers carried out the project, which cost 90 million dirhams, and it took three months to build it. 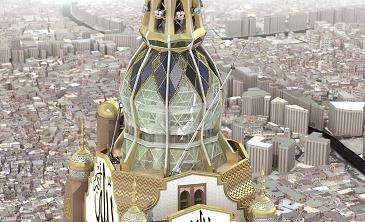 The company has also constructed the Makkah Clock. 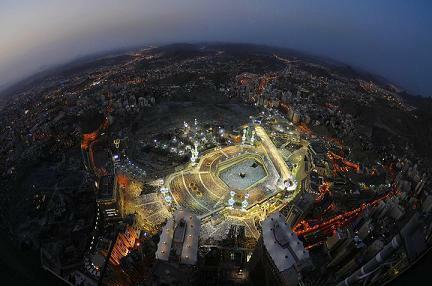 The Crescent was divided into 10 parts to move it to Makkah. The crescent was partly-assembled on the base of the clock-face to reduce it to 5 parts. 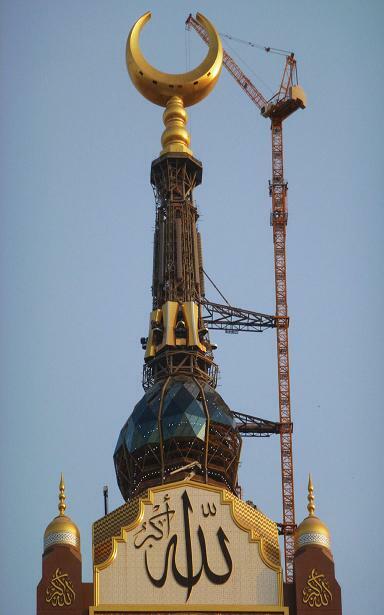 Those five parts were then lifted and installed above the spire from 20 June to 6 July, 2011. The minaret and its base have been beefed up by massive loudspeakers that will emit prayers call to a distance of seven km while nearly 21,000 lamps will illuminate the surrounding area to a distance of 30 km. During occasions like Muslim Eids and new Hijri years, a 16-beam light will illuminate an area of a diameter of around 10 km while 21,000 lamps will beam white and green lights to a distance of 30 km. The light beams are intended to allow deaf persons or Muslims in far areas to know prayer timings in the western town of Makkah and nearby cities. � The building will house a total population of 65,000. � The towers have a combined floor area of 1,500,000 m� and a site area of 34,794 m�. � The building will cost an estimated US$ 2 billion. - 6 residential towers (27-33F) 302,000m� 864 units. � Building was planned to be 485 meters tall at the beginning, later increased to 591 meters. In July 2010 it has been published that the final height will be 601 meters. � With the industrialization and growth of the Muslim population, more and more Muslims are able to afford to conduct the Hajj, the pilgrimage to the mosque at Makkah. This has led to a booming hotel industry in the city. � This complex directly across from the main gate of Makkah's mosque features as its centerpiece a hotel geared towards the profitable Muslim pilgrimage business. The hotel boasts direct views into the courtyard of the mosque itself. � Aside from the 5-star hotel itself, there are also apartments, a convention center, an intermodal transit station, and a 4-story shopping mall which features themed areas resembling traditional markets in different parts of the Arab world. � The name of the building means "The House" and is a reference to the holy Ka'aba within the mosque across the street, which is the Islamic house of Allah. Construction is estimated to cost $1.6 billion US dollars and will be done by the Saudi Binladen Group. I dont like to compare Islam with anything else. But what they are doing is like what I saw in my childhood. This will remind us of many things that take place in other countries like New years celebrations etc. even Batman has lights shining into the Sky to attract attention. Can you imagine, the people near Jiddah will want to break their fasts according to Makkah. "Allahu Akbar" (Allah is the Greatest), in Arabic, can be seen on the top part of the clock. The letter "Alif" in "Allah" is more than 23 meters tall and the crescent, with a 23-meter diameter, is the largest crescent ever made. The two testimonies, "There is no God but Allah and Muhammad is His Prophet," can be seen at the top of the two side faces of the clock, which has been designed in an Islamic style, according to the most precise Islamic criteria. The clock, which weighs 36,000 tons, is more than six times larger in diameter than London's famed Big Ben.